I knew that Donnelly’s Irish Pub would get several shoutouts on my facecrack tenderloin post and sure enough, it did, check it out here. I’ve eaten at Donnelly’s plenty of times but I’ve never had the tenderloin there. 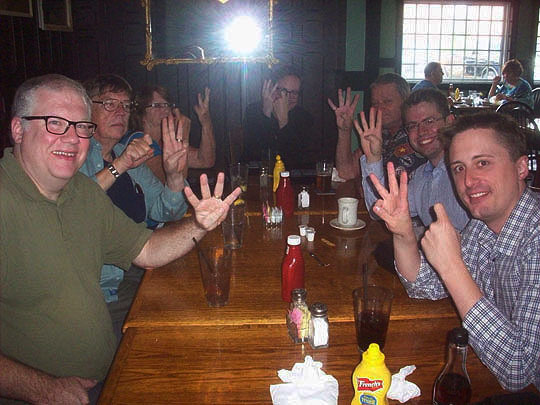 I decided rather than going solo, we’d have an MBIP Contributor’s Lunch and everyone would have to order a tenderloin. Okay, let’s go see who from the MBIP Contributor’s Crew shows up for this tasty tenderloin outing. 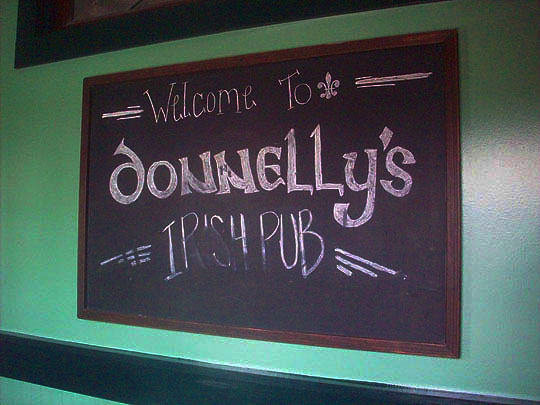 Here we are at Donnelly's Irish Pub, in their new location. Let's go in and see what's happening in Donnelly's on this fine tenderloin tasting day. Here's some press on the walls in the front room from the PJ Star. 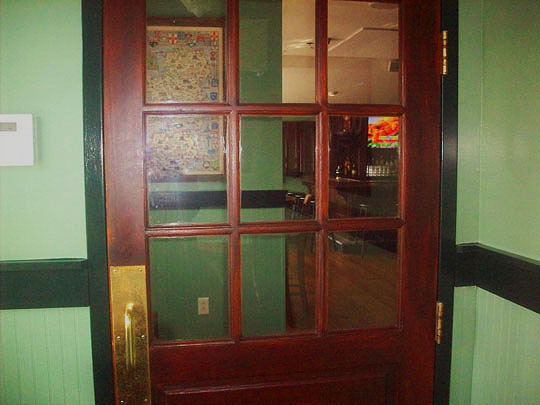 Okay, one more door to pass through and we will be transported to the inner sanctum of Donnelly's Pub. Baboom, we made it safely inside and there behind the hostess podium is the pretty hostess of the day, Jodi, waiting to take us to our table. And here we are at that aforementioned table. I never know how many of these wayward MBIP contributors are going to show up, so I asked for a table for eight and we got one for nine. Well there you go and Bob's your uncle, which is funny, because I actually do have an Uncle Bob. As usual, I'm about twenty minutes early, so let's take a look around in here. They have a classic looking bar up in the front room. There's a nice selection of taps in here and look, hiding behind the taps is owner Molly and waitress Sara. A nice little added bonus to this photo! 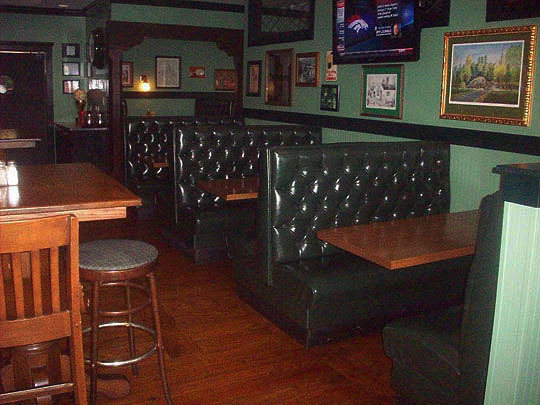 There's comfortable green leather stuffed booths opposite the wall in the front bar area. Here's the large dining room in the back where we're sitting today. Molly told me that the deer that's hanging over our table is named, "Irving." She said the name comes from a porter who worked for Molly and her husband Terry who was a dear man, hence, Irving the deer! 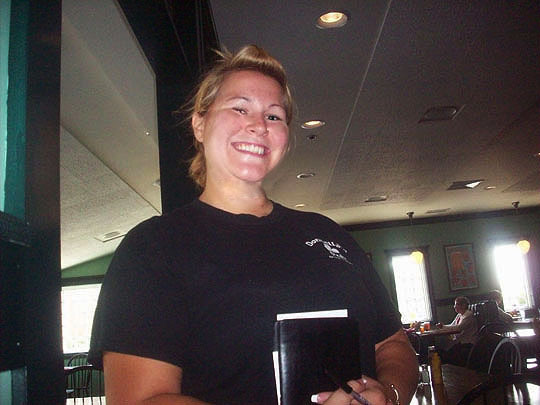 Okay, the contributors have shown up and here's our pretty and friendly waitress Anna taking our drink order. What a great smile! After Anna took our drink order, she took our group photo at the table. Starting clockwise from the left that's: Bob Gordon, Bob "The Whale" Miller, Bob's wife Sue, Yours Fooly, Scott Turley, Brandon Hovey and Chip Joyce. Cheers to the contributors in absentia: Mike Foster, "Boris" Boden, Jaws the Cabbie and Gene Rubbico. Jeff Putnam remains M.I.A. And as you see, "The Glare" makes a special appearance in this photo. 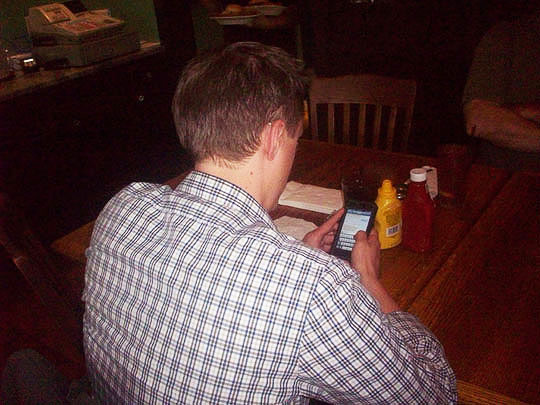 Looks like Chip didn't get the no texting memo, I need to talk to him about that! Here's Anna loaded up with an armful of tenderloins. Wow, that's one big tenderloin. I got mine with onions and I'll add some mustard to it as well. Here's one a little more dressed up with pickles, tomato, onion and lettuce. 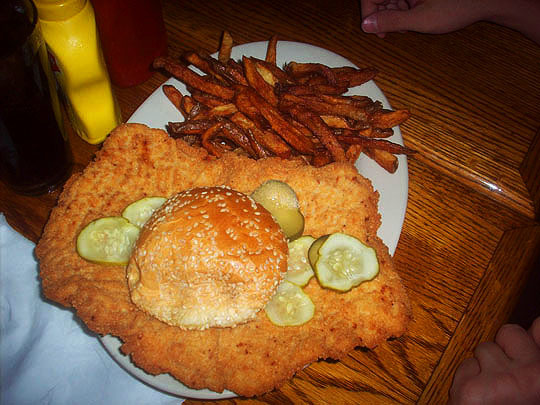 And yet another tenderloin with a side order of their homemade chips. 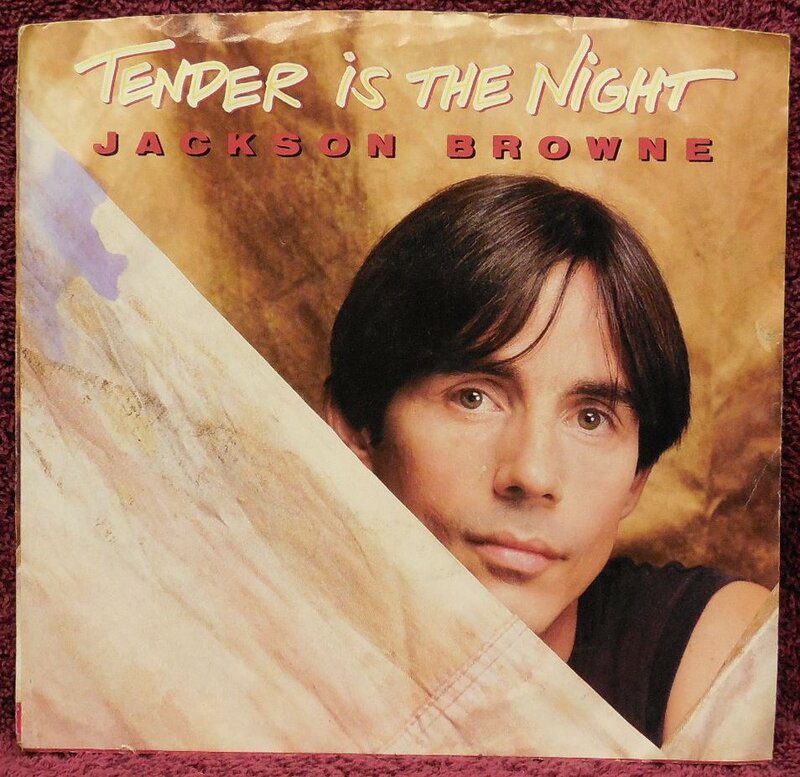 Okay, enough of these photos, I'm starvin' like Marvin over here, let's try out the tenderloin. Wow, that's one tasty tenderloin. Nice and juicy and a good pork to breading ratio. I ate around the bun and was too full to go any further than this. We'll have a nice leftover lunch out of what I didn't eat. And here's the group gabbing away in a little post tenderloin talk. One day later and here's the remains of my tenderloin for today's leftover lunch. We'll add a little of the Inglehoffer mustard that Kathy from Cleveland sent in and see how this tenderloin tastes a day later. One thing I'm discovering is the tenderloins taste even better the second day, it's delicious! See you all tomorrow! 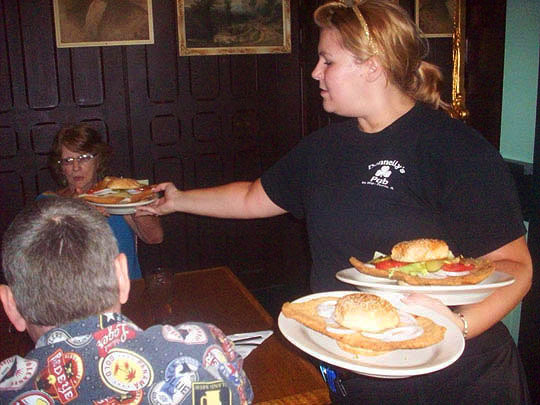 Three and a half Porky Pigs, an outstanding tenderloin is waiting for you at Donnelly's Irish Pub! Related Posts: Midway Duck Inn and Perdue’s.